Sensational drummer Pete La Roca died on November 19th of lung cancer. Throughout his career he performed with legendary jazzmen such as John Coltrane, Sonny Rollins and Jackie McLean. This is our piece to remember one of the most versatile drummers ever. 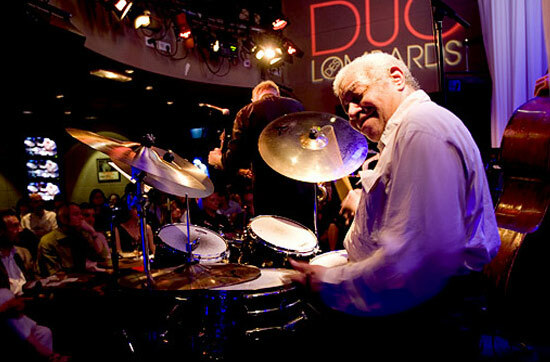 Born Peter Sims on April 7th 1938 he adopted the name La Roca while playing the timbales in latino bands around New York City. He become more and more successful, reaching the top between the late ’50s and ’60s. During those years a young La Roca, who was in his mid-20s, share the stage with some of the biggest names in jazz music: Sonny Rollins, Jackie McLean, John Coltrane and Freddie Hubbard. He collaborated with tenor sax master Rollins on 1957 Blue Note’s A Night at the Village Vanguard, probably one of the most internationally-known jazz records. With McLean he recorded Blue Note’s New Soil (1959), McLean first Blue Note session released, and Bluesnik, a 1961 that was critically acclaimed for McLean solo performance, as well as the spectacular cast of sidemen (including Freddie Hubbard, Kenny Drew and La Roca). In addition, La Roca was the original drummer of the John Coltrane Quartet. Always under Blue Note La Roca played as Huubard’s drummer in both Blues Spirits and The Night of the Cookers, respectively released in 1964 and 1965. The same year, in 1965, Pete La Roca finalised Basra, his debut album as bandleader. The record – that featured tenor saxophonist Joe Henderson, pianist Steve Kuhn and double bass player Steve Swallow – shortly became one of the Blue Note label’s classics. The same year, La Roca collaborated with trumpeter Art Farmer on his Sing Me Softly of the Blues, released in 1965 under Atlantic. What made La Roca’s career unique, is the fact that in the ’60s, while embracing success and positive reviews by jazz journalists from across the US, he left music to become a lawyer. Brooklyn-born saxophonist Dave Liebman referred to La Roca – that translated from Spanish means ‘the rock’ – as a brilliant guy: ‘He was my first teacher in all ways. He was one of a kind… a stubborn, brilliant guy that insisted on perfection‘. La Roca started playing again in the late ’70s. He continued performing (he latest album as bandleader is Blue Note’s 1997 Swingtime), hosting workshops and inspiring eager young musicians until he lost his battle with lung cancer, at 74, on November 19th. He served as inspiration for all the future generation of jazz. He did not run after success, he made jazz for the love of it. He loved jazz and communicated his feelings through his playing style. His music and his contribution to jazz will always be remembered.